John has participated in the SeaShore Transportation Forum since before he joined the Council, and he currently serves as Co-Chair with Shoreline Councilmember Doris McConnell. STF’s members include King Country and the cities of Seattle, Shoreline. Kenmore, Bothell, Woodinville, Edmonds, and Mountlake Terrace. Representatives from Sound Transit, Metro Transit, Community Transit, WSDOT, and the Puget Sound Regional Council also members. 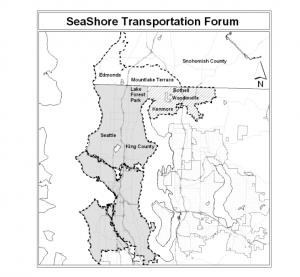 John’s work through the SeaShore Transportation Forum resulted in a coalition of cities along SR-522 signing a letter to request specific developments for transit infrastructure by Sound Transit under the ST-3 plan. The coalition’s effort was successful, obtaining investment commitments for ‘early implementation’ projects for adding Park & Ride structures, roadway, signalization, pedestrian and utility improvements, and adding Bus Rapid Transit (BRT) service to feed frequent and rapid transit service from Woodinville to Link light rail at the NE 145th station. Forming a public / private partnership in making these improvements also holds the potential to transform and re-vitalize our Town Center, with new facilities, restaurants and entertainment venues, in addition to the Park and Ride facility. Sound Transit officials have publicly stated that without the unified voice of this coalition, funding for these projects would not have been allocated.